Thanks to everyone that visited my studio over the last two weekends. I had a record number of visitors and sales. Great comments left in my visitor book and plenty of packets of jelly babies were consumed by all. The Dandelion print sold out it's edition, much to a the dismay of a lady that arrived on Sunday afternoon hoping to buy one. She had to make do with a coaster and notebook, not quite the same as an original, but it shows to get there early on the first weekend. I now need to order more Bike tea towels and Green Pebble cards, update the stock on my website and return some pictures to galleries. Then it's down to tackling the unenvied task of taking it all down and storing it until the next event in September. 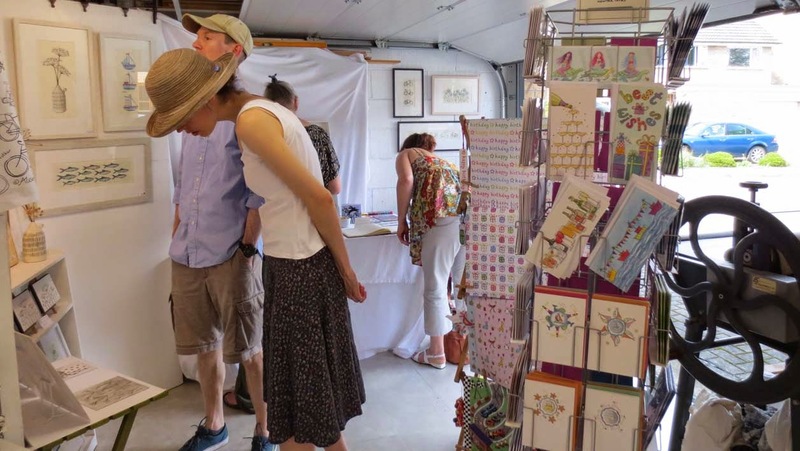 With record numbers of visitors and sales this year my first weekend of my 19th year of taking part in Cambridge Open Studios, was a great success. 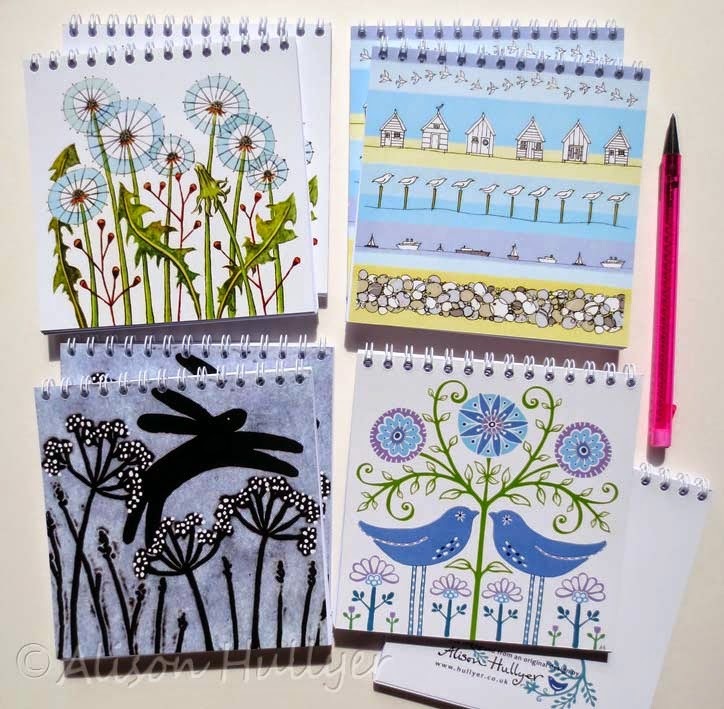 My coasters and new notebooks were a big hit, many being bought as end of term presents for teachers. It's always satisfying placing red dots on the sold pictures and wrapping up the unframed prints for people to take away. 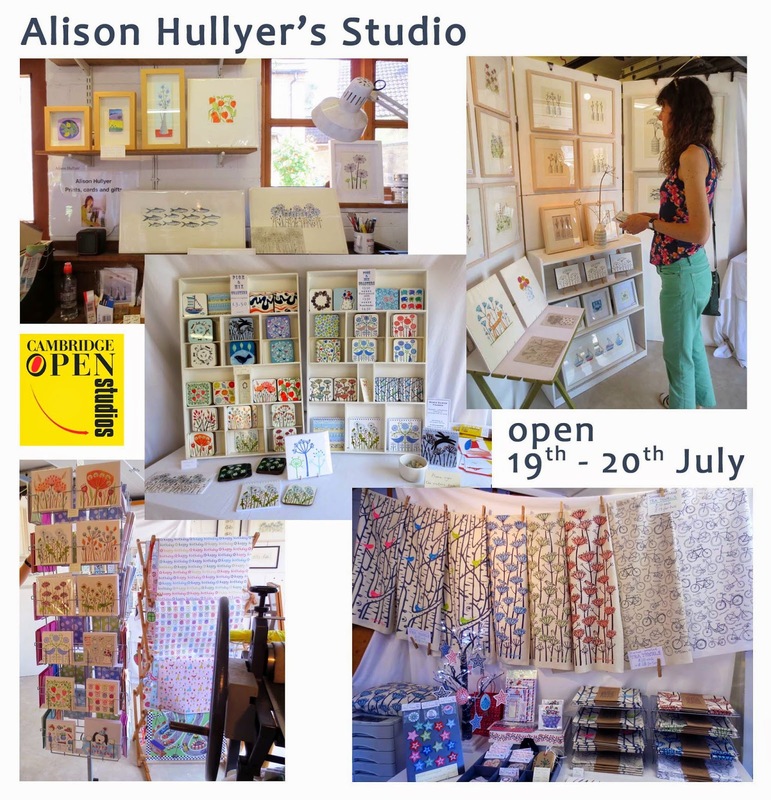 I'm really looking forward to the remaining weekend, my studio doors will be open to the public from 11am - 6pm on 19th and 20th July. 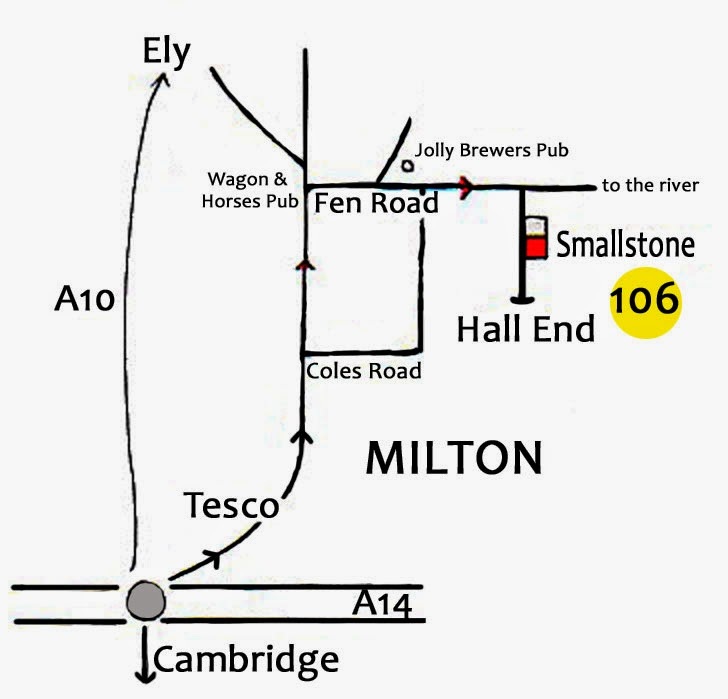 Thunder storms are forecast, so you are most welcome to come and shelter from the showers. July is the month that always seems to come around the fastest! 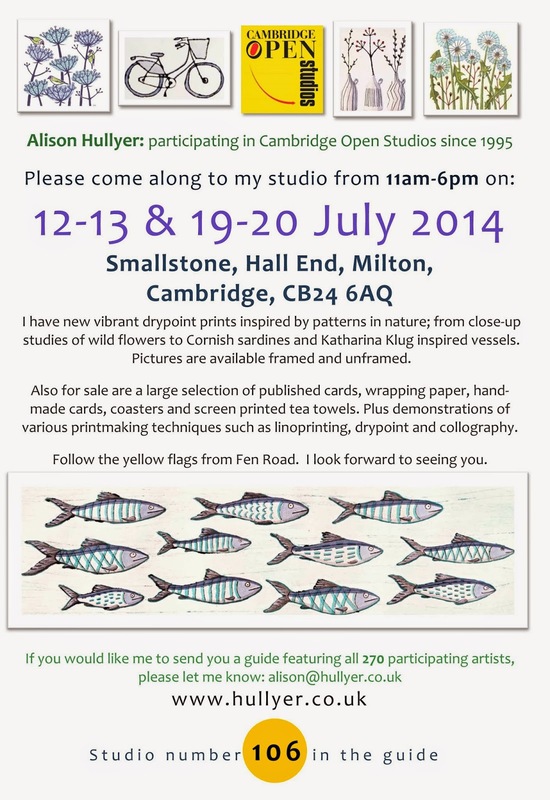 It's Open Studios month and I will be opening my studio for the 19th year from 12th July from 11-6pm. I have lots of new work to show you, including new prints, tea towels, coasters and some special little notebooks. 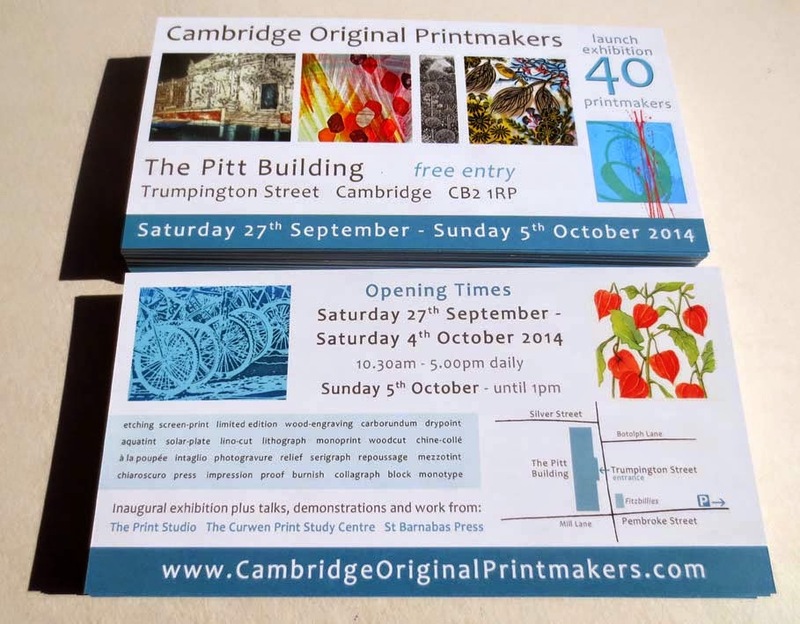 I have been heavily involved in designing the promotional postcards and poster for the Cambridge Original Printmakers show in September. 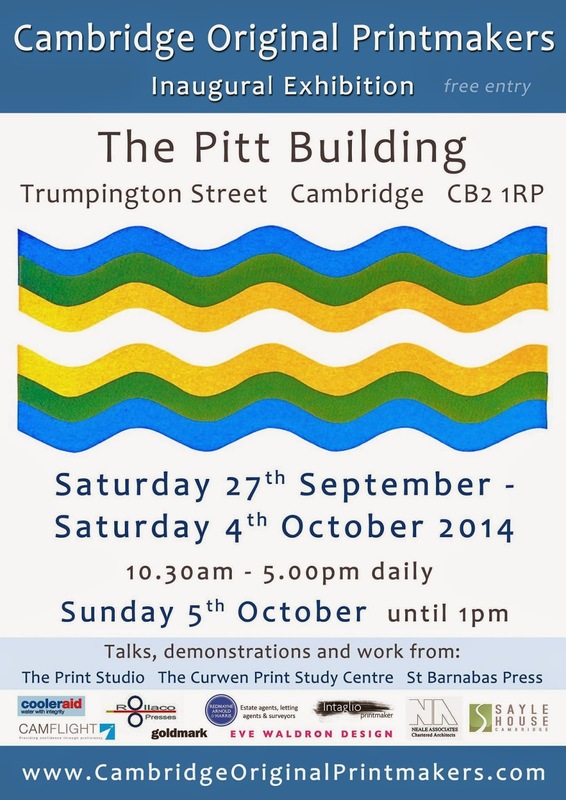 This features the eye catching print by Anthony Hopkinson. And these are the lovely postcards featuring Jenny Saunders, Susan Jones, Andy English, Kate Heiss, Charlotte Cornish, Jo Tunmer and my own Chinese Lantern print.